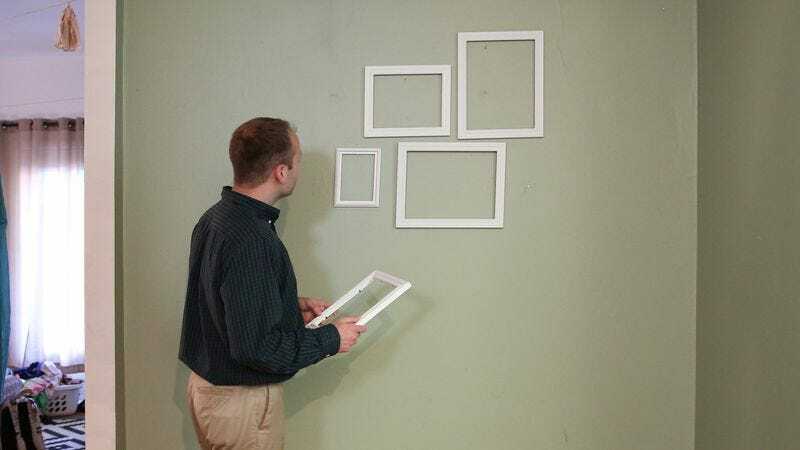 ANN ARBOR, MI—After receiving the mystifying task of hanging an array of nine empty picture frames of various sizes on the couple’s living room wall Thursday, local man Jake Montalvo reportedly admitted that while he wasn’t sure where his girlfriend, Celeste Ladd, was headed with this idea, he was at least willing to go along with it. “Is this kind of what you were thinking?” asked the man tentatively while positioning the frames in a straight line, prompting laughter and a swift correction from Ladd as he struggled to comprehend her puzzling vision. “Oh, like, all together in a bunch? With the little red one down there? Uh, okay, I guess.” At press time, Ladd directed Montalvo’s attention to an old, weathered tin box, which he deduced was either garbage she wanted him to throw away or a central decorative element in some master plan that he was still straining to unravel.